Get a new laptop as a gift and want to turn your old computer into some crisp Benjamins? These 10 online services and apps are all viable options, though each has its strengths, depending on what you hope to sell. At the end of each year, many of us attempt to turn the technology we no longer need into cash. You could be cleaning out the drawers or closets to which you banished old gadgets. Perhaps you treated yourself to a Surface Studio or MacBook Pro and need some extra money to pay for that pricey new computer. Whatever your reason, selling used tech is much easier today than in the past. You used to have to make multiple decisions just to create a new eBay listing. Now the process of listing an item for sale, or getting a quote, often takes only a few minutes, and many more options exist than ever before. Here's a guide to 10 of the best websites and mobile apps we've found for selling used tech, listed in no particular order. Launched in October 2016, Facebook Marketplace is an outgrowth of the buying and selling that happens in Facebook Groups. More than 450 million people use groups on Facebook for buying or selling every month, according to the social network. The idea behind Marketplace is to enable commerce between individuals within the same local communities, while removing some of the uncertainty of sites such as Craigslist. After all, if you can see a seller or buyer profile on Facebook, you're more likely to be comfortable doing business with that person. Payments are made through Facebook or any other method sellers and buyers agree on. The service isn't perfect, though. Marketplace is currently a part of the Facebook smartphone app. It's also only available in the United States, United Kingdom, Australia and New Zealand. You can't rate buyers or sellers, and it doesn't work with Pages, only personal accounts. Amazon (mostly) makes it easy to sell your stuff. When you visit a product page for an item you want to sell, you may see the words "Have one to sell?" along with a "Sell on Amazon" button. You can hit that button, and with only a few more clicks, you can list your product. I've sold lots of tech on Amazon, and overall, I recommend it for the ease of use and transparency in fees you pay. However, I have a few caveats. For starters, you may not find the product you want to sell in Amazon's database. My first-generation, 42mm silver stainless steel Apple Watch with black sport band, for instance, was not listed when I first tried to sell it. As of early November, Amazon extended its auto-returns policy to third-party sellers. Returns requested within Amazon's designated return period are now automatically authorized. In theory that reduces the time sellers spend processing returns, but it also means they can't easily withhold refunds or charge restocking fees if a product is returned damaged. In such situations, sellers must appeal to Amazon. The new return policy for third-party sellers hasn't caused a drastic increase in returns, Amazon told CNBC.com. However, one seller quoted in the article said automated returns "are really going to send shockwaves" through the third-party seller community. 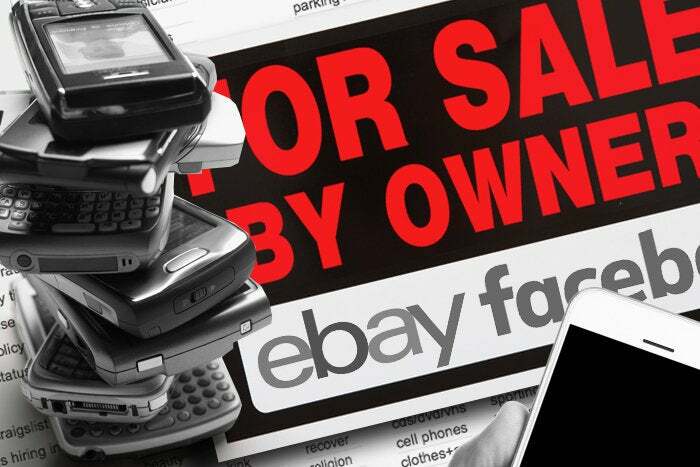 Online auction site eBay has been a popular place to sell used tech for years, thanks largely to its active user base of 165 million members, as estimated by Statista. In recent years, eBay made it easier to list items for sale. You can start by searching for your item, and eBay recommends an auction format based on previous sales. In some cases, the site even gives you a price guarantee if you use its recommendations. With my 2014 MacBook Air, for instance, eBay recommended a 7-day auction with a starting price of $372 and a price guarantee of $519. However, you need to pick through a lot of fine print related to eBay's price guarantee for laptops, cell phones and other gadgets. To list items for sale, you also have to upload photos, add descriptions and decide on shipping options. eBay estimates shipping costs for you, or you can add your own fees if you know the package size and weight. Unfortunately, eBay's fees can add up quickly. For example, if I received $519 for my MacBook Air, the seller's fees would total $53.40 (the least expensive option). And that doesn't include PayPal's cut, if the buyer used that payment option. eBay's fee calculator can provide a good idea of the costs you'll pay. Steep fees aside, eBay's massive user base often makes it a quick way to sell unwanted tech. Swappa is worth a look if you want to sell a used mobile device. Sellers pay no fees, though they do have to pay all applicable PayPal fees if a device sells. (All sales on Swappa go through PayPal.) Sellers also need to roll shipping costs into the asking price. Buyers pay Swappa a fee based on the sale price, and those fees range from $5 to $35. It's easy to create a new listing on Swappa. First you write a headline and description, and then answer a few questions, set a price — based on what Swappa suggests or setting your own amount — and post a few photos. Swappa then provides a bar chart to show price fluctuations for your device over time, which is helpful when trying to set a fair price. For my MacBook Air, Swappa suggested $645. Swappa lets you sell a variety of mobile devices, including smartwatches and VR headsets, as well as smartphones, tablets, Chromebooks and Mac laptops. It does not, however, accept listings for Windows laptops. Gazelle takes much of the hard work out of selling unwanted cell phones, tablets and Macs. You tell the site what you have to sell, it gives you a price, and then you ship it off to Gazelle for free. The site will even send you a box. It pays via PayPal, Amazon Gift Card or by check. This summer, Gazelle began to offer self-service kiosks where you can drop off items for instant cash, though the price you receive is "a bit lower" than what you'd get otherwise, according to the company. Kiosks can also be hard to come by; I couldn't find any when I searched in San Francisco. What you get in ease of use with Gazelle, you might give up in cash. For example, my 2014 MacBook Air, in flawless condition, netted me an offer of only $305. NextWorth gives you fast quotes for a variety of digital devices, including video game consoles, portable speakers, action cameras, and wearables from Fitbit and Samsung. You can sell laptops from Acer, Asus, Dell, HP, Lenovo, Samsung and Toshiba, along with Mac notebooks. The service pays via PayPal or check. It also pays for shipping. But in my tests, offers were low; my MacBook Air got me an offer of only $280 on NextWorth. Close5 is a website and mobile app designed to help people in the same neighborhood or city sell items, similar to Facebook Marketplace. Using the app, it's very easy to create new listings. You just take one or more photos, write a brief description and set a price. That's it. Close5 is owned by eBay, and it doesn't take a cut from the buyer or seller. (Close5 may add optional premium features in the future.) Buyers and sellers communicate using the app and then meet offline to close transactions. People can use the payment methods of their choice, though Close5's site says most sellers prefer cash. Another contender is OfferUp, an online service and app that recently received funding from PayPal cofounder Max Levchin. Like eBay, OfferUp's scope is broad, with categories that include antiques, auto parts, and cars and trucks, as well as computers. The site emphasizes local transactions, and its listings are either auction-style or fixed-price. OfferUp currently does not charge buy or sell fees. Buyers and sellers create profiles. OfferUp then validates users' identities via a provided state-issued ID and Facebook profile. And in some markets, buyers can pay for items using the OfferUp app. Another option for local sales: letgo, an online service and app with a Pinterest-like interface. One thing that sets letgo apart from OfferUp, Close5 and others is its ability to create "Hollywood-style ads" for your items. The company currently does not charge buy or sell fees. However, Craigslist also has many good attributes for buyers and sellers. It's free to use, for instance, and the site offers a huge potential marketplace, depending on the size of your local community, of course. But you should be cautious about the types of payment you accept and read Craigslist's "avoiding scams" page before getting started.